When looking to secure your commercial property against possible break-ins, one of your best courses of action is to install CCTV security cameras. 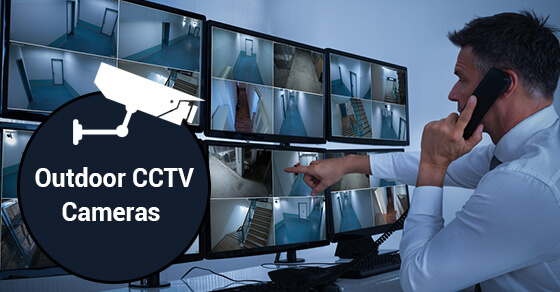 CCTV, which stands for closed-circuit television, is a term that refers to a TV system that emits signals that are monitored either in-house or by a third party for security or surveillance objectives. While this system can help you to safeguard your business interests, you need to be mindful of exactly where you place CCTV cameras if they are to fulfill the purpose for which they were installed in the first place. With that said, read on for the five best locations for placing outdoor CCTV cameras. Number two is a no-brainer! Thieves tend to be wary of gaining illegal access to properties through windows that are visible from the street — that is, if they believe they will be detected. You can stay one step ahead of criminals, therefore, by installing CCTV cameras that focus on a portion of your commercial property that has windows that are not visible from the street. It should come as no surprise that exterior facing doors would make popular modes of entry for criminals looking to illegally access your property. As a result, it makes sense to install CCTV cameras at the front, rear and side doors so that you cover all of your bases. When it comes to protecting your property, don’t forget your parking lot! Depending on the size of your company and the number of people on your payroll, there may be many tens of thousands – or hundreds of thousands – of dollars worth of vehicles, not to mention the property inside of these vehicles. So installing CCTV cameras in the parking lot makes sense. If thieves gain access to your multi-floor property, you can bet that they’ll make use of the staircase. As a result, be sure to install CCTV cameras in the staircase so that you can monitor the area effectively. While it’s a good idea to remember the windows that are not visible from the street, you also need to be mindful of the other windows. Of particular importance are the ground floor windows, since they will represent inviting entryways for criminals looking for the easiest way into your commercial property. It is definitely possible to use CCTV cameras to safeguard your property, but you must install them in the right places in order for them to do you any good. So take a look at the tips for the five best locations for placing outdoor CCTV cameras in order to protect your commercial facility.